MARC service in and out of Washington, D.C., is back to normal after a weekend CSX derailment suspended service for two days. 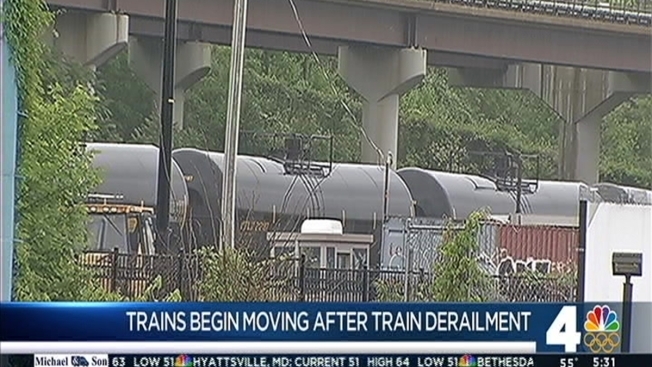 CSX Transportation and Maryland Transit Administration officials said they expect trains to begin moving through the site of the derailment Wednesday morning. CSX announced the timetable in a statement Tuesday. The MTA said MARC's Brunswick Line will operate on a regular schedule Wednesday, although there might be minor delays. CSX also said it has removed soil that was affected by a leak of 750 gallons of sodium hydroxide, commonly known as lye, from a damaged tank car and is working to replace the soil with clean material. Railroad tracks that were damaged during the derailment will then be rebuilt. CSX said five of the 16 cars that derailed have been taken from the site.